Here, everyone has their own legend to make. 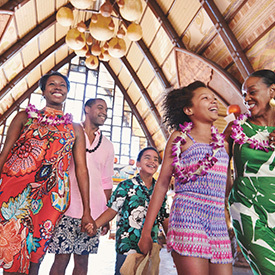 The spirit of Hawai‘i and the magic of Disney come to life at AULANI Resort, a one-of-a-kind Disney experience in Ko Olina, Hawai‘i. No matter how long you stay, you’ll enjoy a magical vacation that includes something for everyone: a complimentary kids club, top-rated entertainment, stunning pools, exhilarating water slides, a relaxing lazy river—and so much more! This spring, escape to Aulani, A Disney Resort & Spa, and take advantage of this special offer when you book by May 8, 2019. The longer you stay, the more you save for stays from March 22 through June 7, 2019, with check-out on June 8, 2019. For complete planning services for your family’s ultimate Hawai‘i getaway, contact our agency today. I began my career in the travel industry as an intern while still in high school. My first plane ride was internationally to Spain and Portugal. From that point on, I was hooked. Travel introduced me to a world of wonder and excitement as I explored new destinations and cultures. Savoring the local cuisine and wines of a destination is one of the pleasures of traveling. I am a beach bum---love to feel the sand between my toes and the salt in the air. There is nothing more breathtaking than viewing the turquoise water of the sea. I have traveled extensively to both coasts of Mexico, Belize, the Caribbean, Hawaii, Fiji, Australia, and New Zealand. I am a certified diver and have explored the great barrier reef as well as the beautiful reefs off the coast of Cozumel and Belize. I've gone zip lining and cave tubing. I have worked with couples planning their destination wedding and there is nothing more fulfilling than watching their travel dreams come true and creating lasting memories. I invite you to give me an opportunity to create your own memories for a lifetime.